Most of you probably know that steeplechasing and point-to-pointing are closely linked. Steeplechasing was given its name in 1752 as a result of the competitive instincts of two sporting Irishmen, Messrs O’Callaghan and Blake, who in County Cork wagered their skills against each oth-er as to who could win a no holds barred contest across country on their fine steeds. They started at the Buttevant Church steeple and finished at the similarily steepled house of worship at Don-eraille four and a half miles away. They jumped everything in the way including hedges, Irish banks, ditches, stonewalls, gates and iron bedheads – you name it they jumped it! Most importantly, both steeples had to be in sight of each other. This was then the birth of steeplechasing as we know it today. These horse races un-doubtedly continued and blossomed in both Ireland and mainland Britain and became an outlet for enthusiasm and gambling by the general public. The earliest steeplechases were linked with hunting and “hunt meetings” were often held, linked to a hunt. These were under National Hunt (NH) Rules after the establishment of the NH Commit-tee in 1863. 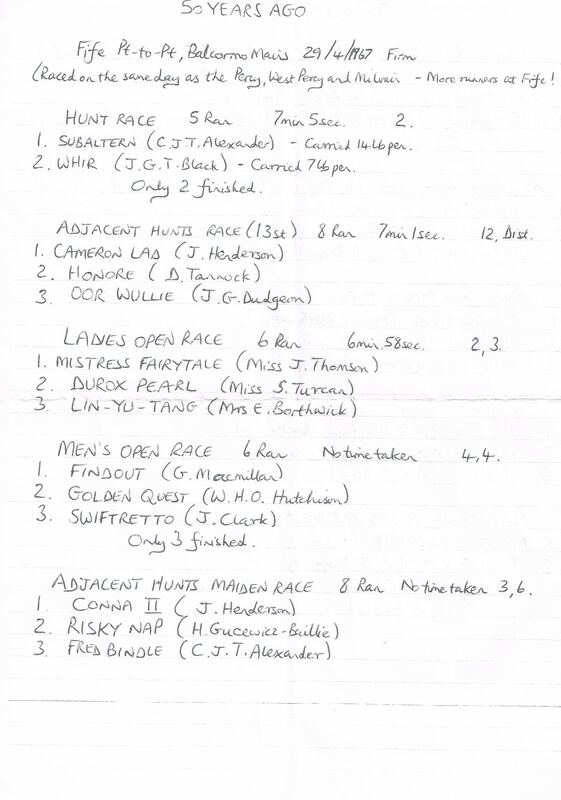 Hunts found the Rules too much of a constraint to them holding an end-of-season jolly and, in addition, many wanted races over natural courses, and from point to point. Yet the expres-sion “point-to-point” did not come into use until 1874 when a race so described was held near York and won by Langar ridden by the Hon E Willoughby. Races at the end of the hunting season, initial-ly between horses of the same hunt or regiment, became increasingly popular. However the for-mal organisation of point-to-pointing did not start until 1885, when the NH Committee insisted that a Master provided a certificate certifying that the point-to-point had complied with five simple rules. No problem! This opened the floodgates for Hunts to hold Point-to-Points initially to provide an exciting day out for spectators and to allow participants to experience the dazzling thrill of racing against each over about 3 and a half to 4 miles of natural countryside. After the 2nd World War raising revenue came to the fore and Point-to-Points were staged as much with this end in view as any other. But what about Fife? The Fife Hunt, with its extraordinarily distinguished history, has formally been in existence since 1786 – so this year the hunt celebrates its 230th anniversary. Now the Fife point-to-point this year (2016) will celebrate 124 years since the start of hunt horse racing in Fife. To start with, the racing was held at Bruntshiels Farm near Ceres. The very first race on that day the 19th March, 1892 was the Welter Race which was won in “under 20 minutes” by a hatless Sir Ralph Anstruther of Balcaskie riding Aide de Camp. He finished in a “sea of mist” after his opponents had taken the wrong course! Bruntshiels staged the point- to-point from 1892 to 1897 and from 1905 to 1909. Runners were a little scarce, fallers were many and finishers few but it was hugely enjoyed which explains why after 124 years Point-to-Point racing is still so popular. Oh, and on the back page of the 1906 race card there was a “NOTICE” saying “Riders who are not competitors are not allowed on any part of the ground except the Winning Field”. But remember it was 1906 and before the motor age it was common for people to watch races, and even follow the race, on horseback. 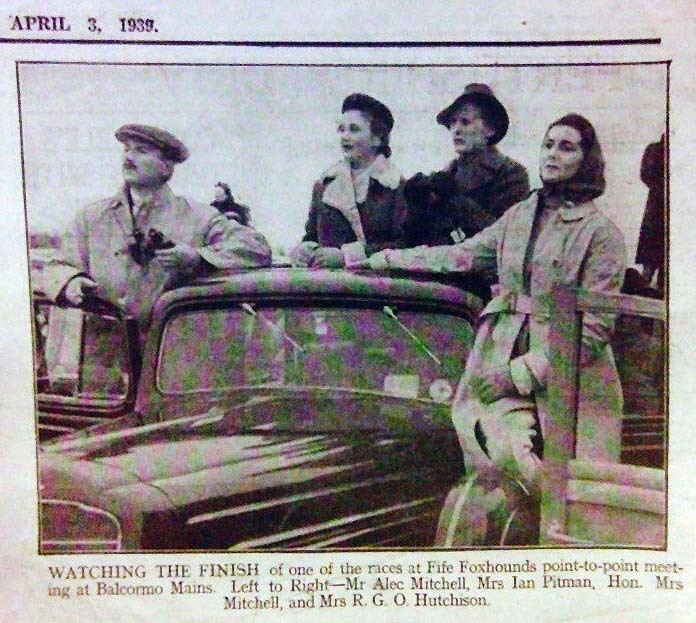 The most important date, however, is when the point-to-point moved to Balcormo Mains in 1924 on the Montrave Estate of Sir John Gilmour. 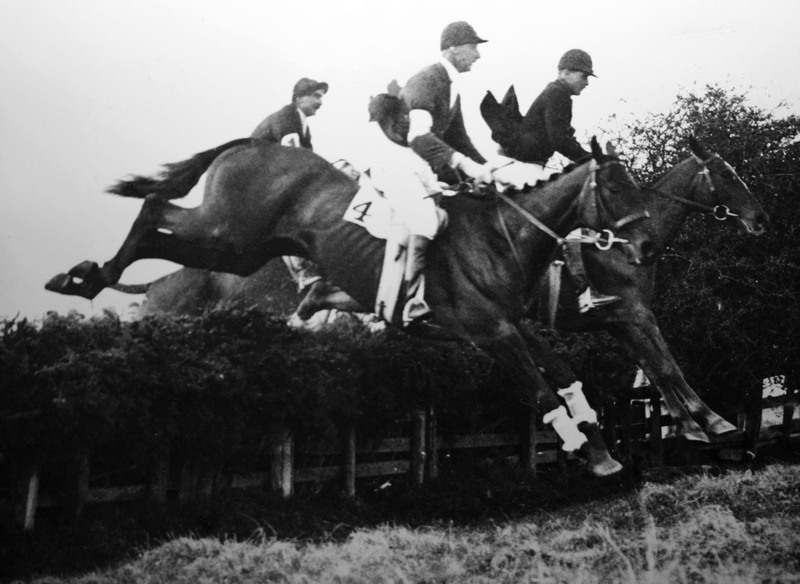 The course of some three and a half miles comprised 21 jumps – 16 hedges, three post and rail fences and two ditches. The start was close to Carlhurlie reservoir. The first race at Balcormo Mains was a Welter Race which Captain R. Cheape won on Rufus, carrying 14 stone. There were five contests – all over three and a half miles with weights ranging from the Welter Race at 14st or over (Penalties took the official weights to 15 stones!) to the Light Weight Race at 12st 7lbs or over. These amateur foxhunters must have done themselves quite well! The official race card of that year is fascinating. It starts with the price of the card being sixpence (two and a half pence) and then in a small but bold font stern words about the Rules of Racing and Steeplechasing and the consequences of not obeying them. Happily this is condensed to nine lines but importantly it let the public know that there was a central “Big Brother“, although this had been in existence since 1885 (see above). But perhaps a little bit of explanation is appropriate here about the evolution of clothing and sad-dlery since those far off days. In the early days of point-to-pointing, riders wore foxhunting kit of heavy red or black coats (no colours in those days – punters had to check the number cloth) breeches, heavy boots and of course heavy saddles. In those days no concessions to safety were made apart from the substitution of top hats for a black (usually) silk cap – no crash helmets! Safety began to creep in gradually in the late 1950’s with crash helmets made of cork and no chin straps initially. And then body protectors, gumshields and infinitely better helmets. Colours, at first jerseys and now mostly silks and racing saddlery which was lighter and more efficient for racing all evolved. Initially the jumps were all natural field boundaries but these were improved by purpose-built ones. The racecourse itself was also im-proved – no more plough for instance! That of course allowed lighter weights to be deployed and the weights now range from at the top end 12st 7lbs for Men’s Races and 11st for Ladies. In the Hunt Race they also have a heavyweight division of 13st 7lbs. Almost most importantly the riders are now quite a bit fitter and more dedicated! This now brings us to the subject of Ladies racing in Point Points. These proved very popular with the first recorded ladies point-to-point race at the Collindale Drag hunt north of London in 1897. The first foxhunt to stage such a race was the Hambledon in 1899. 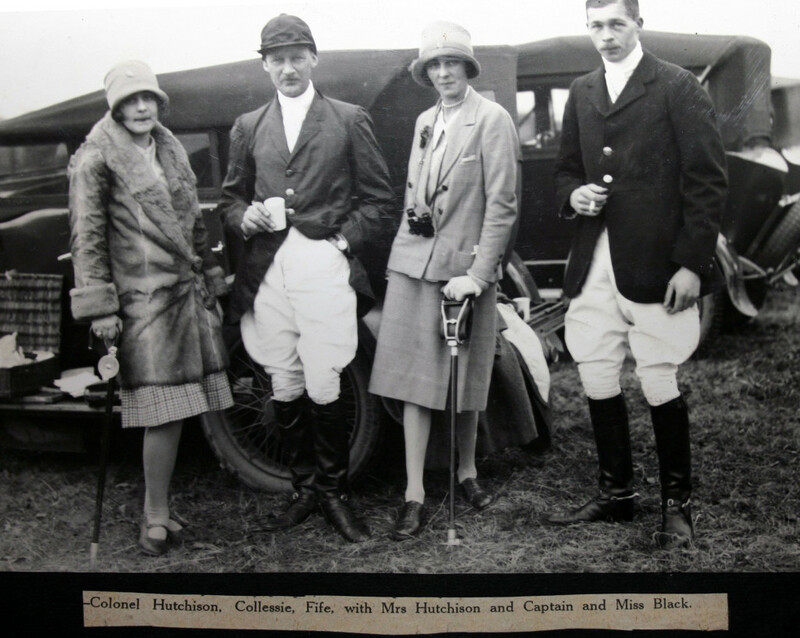 The Fife’s first was in 1925 and won by Mrs Cheape on Eden’s Pride from seven rivals including Mrs Ellis on “Plumber” who was con-cussed at the last when in the lead! They rode over the same course and jumped the same obsta-cles as men. Unlike the men some rode side saddle and continued to do so in some places until the 1980’s. This style is much more dangerous as in the event of a fall the lady is not thrown clear. They appropriately carried quite a lot less weight than men – 11 stone. In 1974, the age of equal opportunity crept in and ladies were allowed to compete on equal terms against men, some of them carrying loads of lead in weight cloths placed underneath the saddle. No concessions here. At the same time the “Open” race which was ‘open’ to all eligible horses appropriately qualified in both Britain and Ireland were divided between the Men’s Open and the Ladies’ Open. The twain did not meet! In those races the enterprise of owners of good horses is interesting because many travelled from as far away as Yorkshire (even in the early days). Let us now concentrate on the racecourse at Balcormo Mains, near Leven. 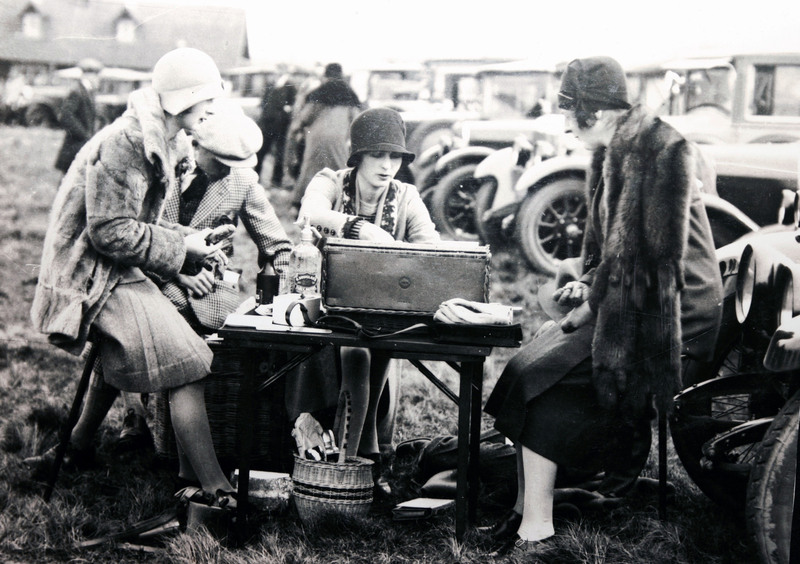 Well, the point-to-point has been held there since the first in 1924. There was no racing between 1939 and 1949, as a consequence of the second World War, and in 2011 and 2012, bad weather took its toll on the ground and they had to be cancelled. Now when fully dressed up it is a magnificent and recognisable right handed racecourse and all races are run at just over three miles on excellent turf and across 19 beautifully made portable steeplechase fences. Two are jumped twice while five are jumped three times. No natural obstacles now, although for five years starting in 1982 an experiment was made with a natural course for the Members’ Race. It didn’t catch on because basically the Bookies didn’t like it! The course has changed dramatically since pre-war times. Now it is two and a half circuits all within view of the spectator enclosures. From 1924 to 1939 there was only one circuit – the three and a half miles being achieved by starting at Carlhurlie (see above) and racing around and to the south of Balcormo Mains. Some horses were asked to do this twice on the same day! Great fun for the riders but less good for the spectators (not to mention the twice raced horses!). The 1950 course was changed to something like the present configuration, but left handed, in order to give spectators a better view. 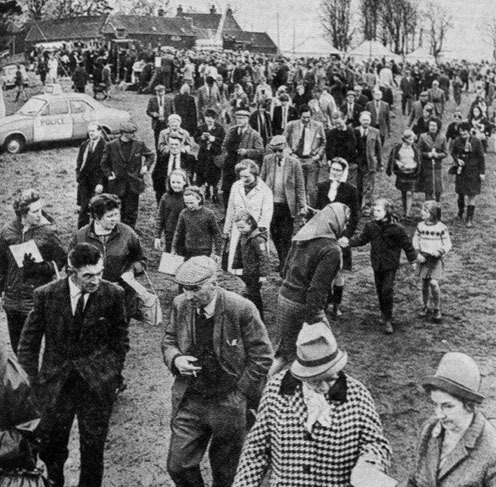 This came to an end after the 1987 Point-to-Point when jockeys complained after the second race to the landowner and organiser John Gilmour, (later Sir John who tragically died in 2013) that the last fence in the back straight always known as the Annfield Drop (a drop means that the ground is lower on the landing side than the take off – like Becher’s Brook – was becoming dangerous as it was very wet and boggy on the landing side. John, a man of decisive action grieved for about 30 seconds because it really was a proper test of horse and rider! However he then set out swiftly with appropriate farm machinery and removed it as well as temporarily diverting the burn (stream) which ran down the landing side (Becher’s Brook again!). The job was done in half an hour and racing resumed. No mean task as the fence was a permanent obstacle. So what to do next year 1988 Without going into boring detail much the easiest solution was to reverse the direction of the course which at the same time made the back straight more visible and much more horse friendly as it climbed up ever so slightly. And thus it has remained most successfully ever since. The Fife point-to-point, locally called the Balcormo Races, now has at least six races and usually two pony races so there is no shortage of sport. Remember from 1892 up to 1979 there were only five contests at most. It is now a feast of sport. Bookies too have found it so and almost certainly have been in attendance since the beginning. Only boring old walk overs have ever detracted from lively betting markets taking place. 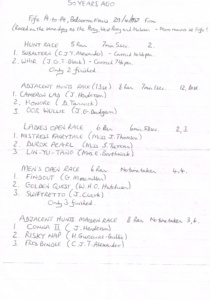 In 1981 Bill Turcan, the then Joint Master, took over running a Tote when the official T0TE pulled out. It was not catastrophic but neither did it produce a sufficiently substantial revenue and Bill stopped it after two years. What it did do was infuriate the Bookies who countered by offering more attractive odds to the punters which was not quite the object of the exercise as far as the Fife Hunt were concerned! Apart from being the most northerly point-to-point in the British Isles it would lose hugely in both revenue and character were it not for its deserved accolade as Scotland’s finest annual al fresco party. Starting in the mid 1950’s, it grew and grew as Fife, Perthshire, Angus and even Edinburgh Society folk came to understand the wackiness of it all. Picnics too became larger and more sophisticated. The late Sir Jimmy Gulliver (and I’m sure he wouldn’t mind this being mentioned) really took the biscuit. At 10am his station wagon would arrive with appropriately liveried attendants who would set up a mahogany table with all the silver trappings and formal chairs – whatever the weather! Sir Jimmy would arrive just before noon in time to have a full luncheon with his friends waited on by his butler, chauffer and a couple of footmen. Champagne and fine claret flowed. It was a hoot! Now, nobody quite emulates this excess, some might say, but for many years plenty of Fife “society” jolly well made sure that they parked their vehicles on the front row – by fair means or foul (I know!) They still do because picnics are so much more agreeable on the front row! Every year Fiona of the “Speaking Personally” column in The Courier used to come to the Races with a photographer and fill her notebooks and exhaust her photographer’s film supply with some terrific material for her widely read and popular column. Some anecdotes still stick in the memory. Here are three. 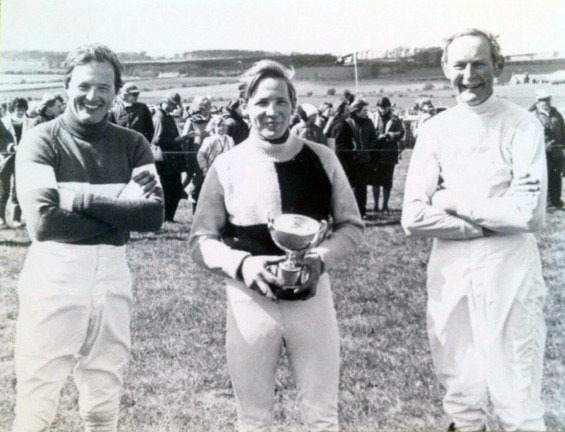 Tim Black a keen foxhunter who lived at Teasses, only one and a half miles away, often competed but he had one horse, named Arran Baron, who preferred home to galloping a couple of circuits at Balcormo and regularly deposited Tim at the fence nearest his stable and idly trotted home! Then there was another enthusiastic if almost blind amateur jockey who wore contact lenses to see at all. Now when he bit the dust, which was often, he almost invariably lost one of his lenses and was often seen crawling around on his hands and knees searching for the wretched but very small piece of clear plastic. Meanwhile, ambulances were mobilised assuming he was hurt! At least he got a lift back! 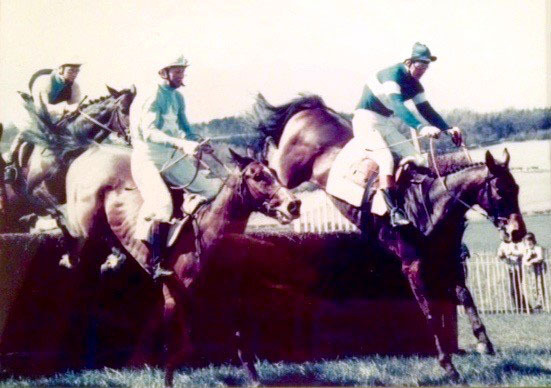 Then when that same pilot injured himself badly at Perth races he could not take the ride on Panegyrist for the mighty and legendary Cyril Alexander in the Hunt Race. Cyril was in a pickle but on the original pilot’s advice he eventually asked Lucinda Russell who had been showing an enthusiastic desire to take part in this game. With some trepidation; she was a very good event rider but as yet had never ridden in a race, she agreed to ride his beast. She duly won the race and all of a sudden eventing went onto the back burner and horse racing took over her’s and her father Peter’s lives. Lucinda is now of course an accomplished racehorse trainer. One could ramble on about racing through ploughed fields (which they still do in the Czech Republic’s “Gran Pardubice”) and many other things like riders eligible ages which have now stabilised at 16. There used to be no such age bar and Jimmy Frost, who won the Grand National on Little Polveir, rode in a Point-to Point when he was 14. Mind you there has never been an upper age limit! Many 50+ year olds have competed at Balcormo – some successfully but not without a bit of mumbling amongst the punters! Most importantly though this piece cannot be wound up without mention of really the most important people of all and those are the farmers and landowners throughout Fife and the landowners of Balcormo and Annfield. The farmers and landowners first, as without them there would be no hunting and almost certainly no racing. But specifically we must also thank the mighty Gilmour family, who initially owned all the Balcormo land and in particular the late Sir John who masterminded the whole affair for 40 odd years and latterly Mr Rae Grieve who acquired Annfield Farm, which accounts for about one half of the course, 23 years ago and who has since then offered enthusiastic support. After Sir John died who was going to take over the running of this pretty mammoth event? Fiona and Jim Drysdale made the very brave decision to do so and with the help of Lady Gilmour, Sir Nicholas Gilmour and a Committee have very successfully resurrected the Fife point-to-point, it having nearly gone off the map with the two blank years in 2011 and 2012. Finally, through the history of point-to-pointing is the overriding theme that it is an amateur sport. Yes there is official prize money now for winning owners which started in 1913 at a maximum of £20 for an Open Race when previously the reward had probably been a “silver cup”. Prize money has increased from that £20 limit to, in Fife , £500 to the winner of both Open races ………and there might be a ‘Perpetual’ cup too! The valuable input of Sponsorship is also important to the running of the Point-to-Point and is both very gratefully received and also provides an effective and exciting promotional tool for those Sponsors . Thank you for reading this. Don’t forget this year’s point-to-point will be at Balcormo on Saturday, 29th April 2017.